Bursting the Bubble: BC's Point Shaving Scandal | BANG. People often refer to going to Boston College and living in Chestnut Hill as “living in a bubble,” and this statement isn’t unwarranted. The people are nice, the buildings are pretty, and the gates around the edge of campus seem to keep out any wrongdoing or vice. For most students, including myself, it is tough to imagine that things were ever any different. For those who had their television set to ESPN a couple weeks ago, however, this bubble has since burst. On Tuesday Oct. 7, ESPN aired a 30 for 30 (their sports documentary series) episode about our very own Eagles. Any Boston College student can’t help but feel deceived, and almost dirty, after watching this and learning of the events that took place here during 1978-79 basketball season. It makes us wonder how could this have happened, how could so many of us not know about it as students, and how far have we come since this incident? Photo courtesy of ESPN 30 for 30 / Facebook. If you don’t know what happened, let me just start by saying it was bad, real bad. We’re talking the Mob, threats, point shaving, players taking money, and pretty much any other shady thing you could imagine. In short, after some coincidental encounters in prison, old connections and shady meetings, Boston College men’s basketball was suddenly being coached by the Mob. Local mobsters linked to Henry Hill, a crime lord from New York connected to the largest cash theft in our nation’s history and countless murders, had developed a relationship with BC basketball player Rick Kuhn. Kuhn wasn’t exactly the traditional BC student athlete. He was a tough poor kid from Pittsburgh, who had already tried his hand at minor league baseball out of high school. Kuhn met multiple times with mobsters who asked him to ensure their bets would be good. If the betting line was BC winning by 10, Kuhn would make sure the Eagles win by 9 or fewer, thus earning the mobsters money when they bet against the Eagles. Kuhn still contends he did not actually shave points, just took money from the Mob. This defense ultimately did not stand up in court and he was given a 10 year sentence. Where the questions come in is the involvement of other players--specifically the Eagles’ captain, Jim Sweeney, and their best player, Ernie Cobb. Sweeney was the type of kid the school puts on brochures. Great student, great person, not the most talented player on the court but a hard worker and a smart player. Sweeney admits going with Kuhn to meet the fixers once but never actually acting on what he was told to do. Hill says that is not how it went at all. According to Hill, when the Eagles captain heard the plan he loved it so much that he pulled out a schedule and circled the games where they could put on the fix. Both Hill and Sweeney do say attest to Hill’s men threatening Sweeney by lightly pointing out that it would be difficult for him to play basketball with a broken arm. Ultimately, there were 8 games where the Mob bet against the spread and Boston College struggled, coincidentally or intentionally, causing the Mob to win big. In total, about $250,000 was won for higher ups in the Mob on Boston College basketball games. Kuhn, Sweeney and Cobb all took money from the fixers, but the court decided only Kuhn was guilty of actually attempting to shave points. The university does a fantastic job of making sure this slip-up is never mentioned or seen anywhere. Part of the reason that the “Season of the Mob” is never talked about is how far we have come since the late 70’s. In an era of collegiate athletics where you can’t catch your breath between NCAA violations and scandals at big time universities, Boston College stands now as a model for having student athletes that truly are student athletes. Just look around at other universities. Note Dame had its huge cheating scandal; a North Carolina professor came out saying that the university provided the athletes bogus classes and gave A’s to nearly illiterate students; but Boston College has been impeccable. 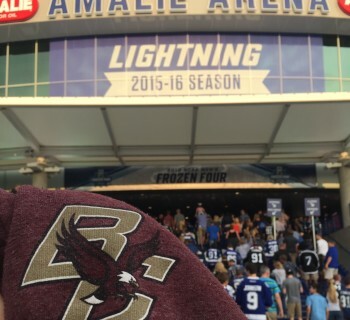 BC is fifth in the nation with a 96% graduation rate for its athletes, and is ranked third in football specifically. They also had 10 teams achieve a perfect APR (Academic Progress Rating) which was near the top of the nation. BC has stayed out of the news with other NCAA violations and legal issues like those that have happened at Florida State, Texas A&M and Duke. While the 30 for 30 was shocking and unexpected, it really gives everyone a chance to look at the university’s athletic program now and realize that what we have here is special. Very few Division I programs can claim that their student athletes excel on the field and in the classroom like those here at Boston College. I really do recommend that every student here watch “Playing for the Mob” just to realize that things can go wrong here in Chestnut Hill. However, we should all walk away from the 30 for 30 thankful for what we have in our athletic program and hopeful that BC basketball is on ESPN more this year for big wins and not big crime.